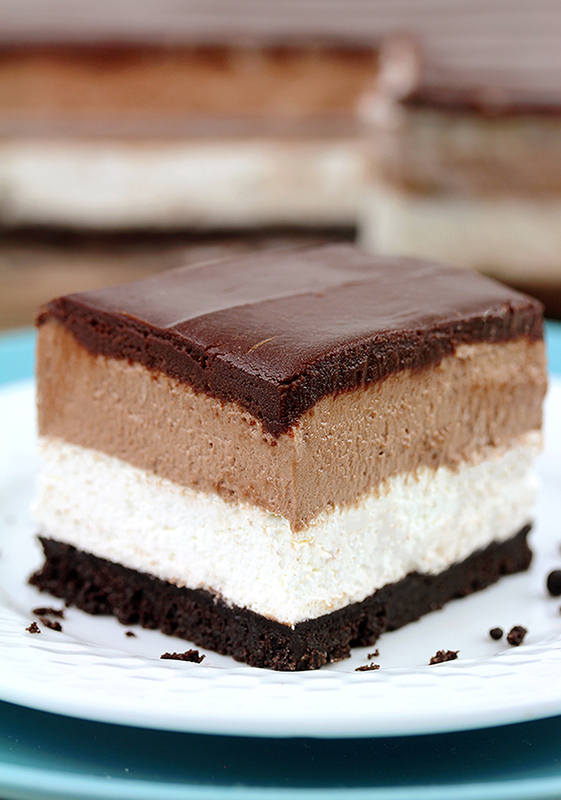 Easy No Bake Nutella Cheesecake Bars – quick and perfectly creamy cream cheese and Nutella dessert, with Oreo base and chocolate ganache. Do you fancy quick, no bake desserts? It´s my kind of sweets. – light, creamy, quick and easy to prepare, without using your oven and wondering whether they will turn out well or not. For all Nutella and no bake desserts, Easy No Bake Nutella Cheesecake Bars makes a perfect choice. It has some layers – the base is made of Oreo crumbs and butter, the first layer is made of cream cheese, sugar, heavy cream and vanilla, while the third layer consists of all these ingredients + Nutella. Chocolate frosting come on the top. The base is crunchy, while the layers are perfectly creamy. What do you need to prepare Easy No Bake Nutella Cheesecake Bars? How to prepare Easy No Bake Nutella Cheesecake Bars? Combine Oreo crumbs with melted butter and press on the bottom of an 8 inch pan. Beat cream cheese and powdered sugar with vanilla, until smooth. Whip heavy cream, then fold in the cream cheese mixture and stir well. Divide it into two bowls. Use the mixture from one bowl to spread over the Oreo layer. Add Nutella in the other bowl and beat until well combined. Spread evenly over the cheesecake layer. Let it cool in the fridge, while you prepare ganache. Warm up heavy whipping cream in the microwave for 45 sec-1 min. Take out of the oven before the bubbles appear. Pour over chocolate chips, cover and leave for 3-4 min. Whisk until chocolate melts and the mixture gets smooth. Let the frosting cool for a few minutes, and then spread evenly over cheesecake. Let it cool over night. Cheesecake fans should check out our most popular recipes on the blog – Chocolate Mini Cheesecake with Oreo Crust, Cheesecake Banana Bread Crumb Cake and Easy No Bake Oreo Mint Cheesecake. If you love sweets, take a look at our DESSERTS page, where you´ll find loads of different recipes, from no bake to bake, along with chocolate, fruit, creamy, crunchy to decadent. Choose a recipe that suits you best. If you like Nutella, you should definitely try Easy No Bake Nutella Cheesecake Bars. Enjoy it! Easy No Bake Nutella Cheesecake Bars – Quick and perfectly creamy cream cheese and Nutella dessert, with Oreo base and chocolate frosting. Do you fancy quick, no bake desserts? It´s my kind of sweets. - light, creamy, quick and easy to prepare, without using your oven and wandering whether they will turn out well or not. TO MAKE THE BASE LAYER – in a medium dish combine Oreo crumbs and melted butter, then press on the bottom of an 8 inch pan. Set aside. TO MAKE CHEESECAKE - beat cream cheese, powdered sugar and vanilla until smooth. Whip heavy cream and then fold in cream cheese mixture and stir well. Divide the mixture in two parts. Use the mixture from one bowl to spread over the Oreo layer. Add Nutella in the other bowl and beat until well combined. Spread evenly over the cheesecake layer. Let it cool in the fridge, while you prepare ganache. TO MAKE CHOCOLATE GANACHE - . Warm up heavy whipping cream in the microwave for 45 sec-1 min. Take out of the oven before the bubbles appear. Pour over chocolate chips, cover and leave for 3-4 min. Whisk until chocolate melts and the mixture gets smooth. Let the frosting cool for a few minutes, and then spread evenly over cheesecake. Keep refrigerated up to 7 days.